March | 2015 | Every good thing…. Let there be light and such…. Had a very busy long weekend working on the boat and motor. Things are going swimmingly. Our new Achilles dink has been ordered from Defenders annual spring sale. We are looking forward to using it on future trips. We wanted something that can hold 4 adults and gear was reliable and light. Working with our little Honda outboard we should be set up well with this purchase. We also added a bit or gear to the SUV. A cargo rack the fits in the receiver hitch. 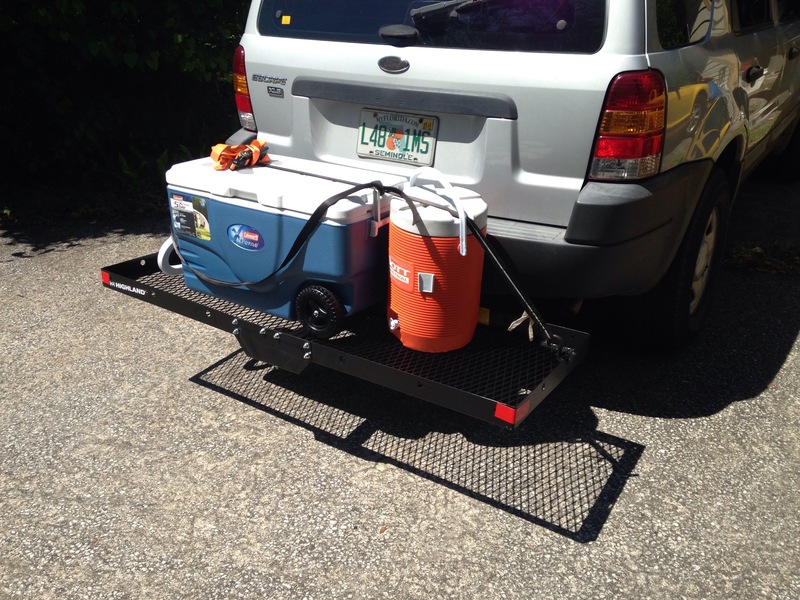 It works great hauling our cooler and water cask. It will also come in handy once we have the baby as we will not have to haul fuel inside the vehicle and will free up space for strollers and such. Cargo hauler. Makes icing up easier. After several months of working on the mast or motor full time we have finally been able to turn our attention back to the boat. 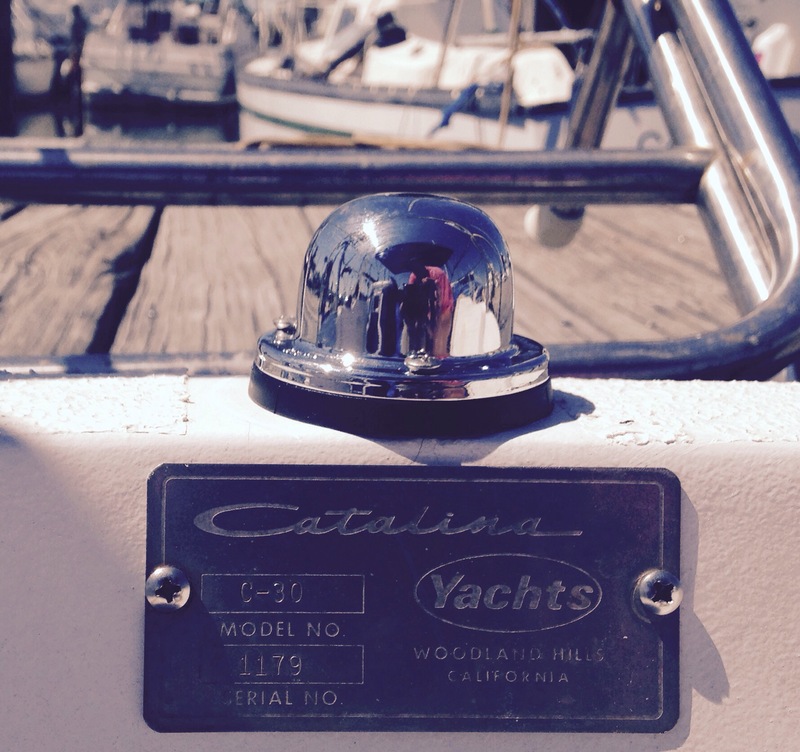 Our first order of business was installing our new fuel tank that we received from Catalina Yachts. Here is the new tank sitting on end waiting for install. First we had to remove the old tank. Funny that on the old tank you can see lines where the boat had flooded in the past. It did not seem to have any holes but at over 30 years of age we figure it best to replace as we are going from diesel to gas and the thing has years of crud and corrosion. 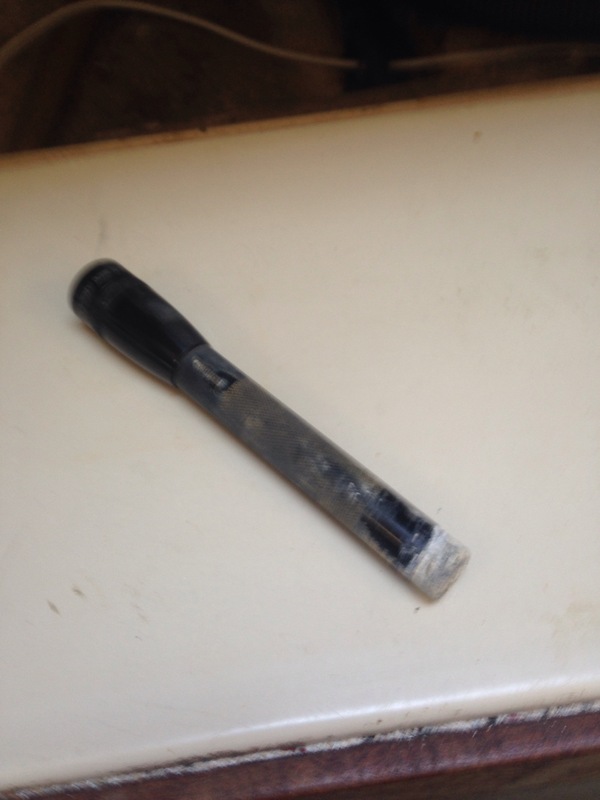 As an added bonus I was able to retrieve the flash light I dropped down in the skeg when replacing a broken transom thru hull about a year ago. Lost mag light that is now found. After the fuel tank we moved onto electrical work. I spent some time figuring out the Dual AB switches on the battery banks. I came to the conclusion we only needed one AB switch. A for the yet to be installed starter battery and B for the house bank. We can use the switch to isolate the start battery from the house when starting but we can gang them together for charging once underway or when locked up and using the solar panel. It looks as though we will be putting the Start battery in a box next to the fuel tank, I will have to glass some wood to hull to secure the box in place. By putting the start battery in the back we will have more room in the engine bay for our fresh water cooling and its heat exchanger and pump. I also did some other wire work, I was able install the running lights wire them up. We now have function Nav lights like a real boat should. 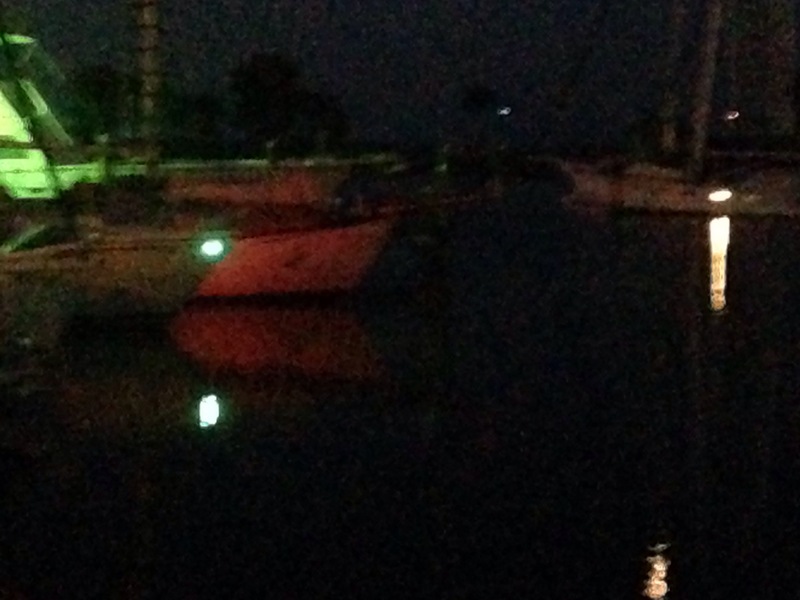 Starboard bow light, you can see the red port light reflecting off the Betty, our neighbors boat. As I was installing the stern lamp I also took the time to reattach the manufacturers number plate. As I had the galley drawers pulled to run wire I took the time to get out the heat gun and heat all the waste hose clamps and tighten them down again. Let me tell you the heat gun is great, after doing this I filled the waste system to overflowing with fresh water. Not a sign of a single leak. It is safe to say the waste system is 100% done and ready for service. After rewiring the AB switch and some other DC lines we thought it best to open the bilge and check that the pump was still functional. 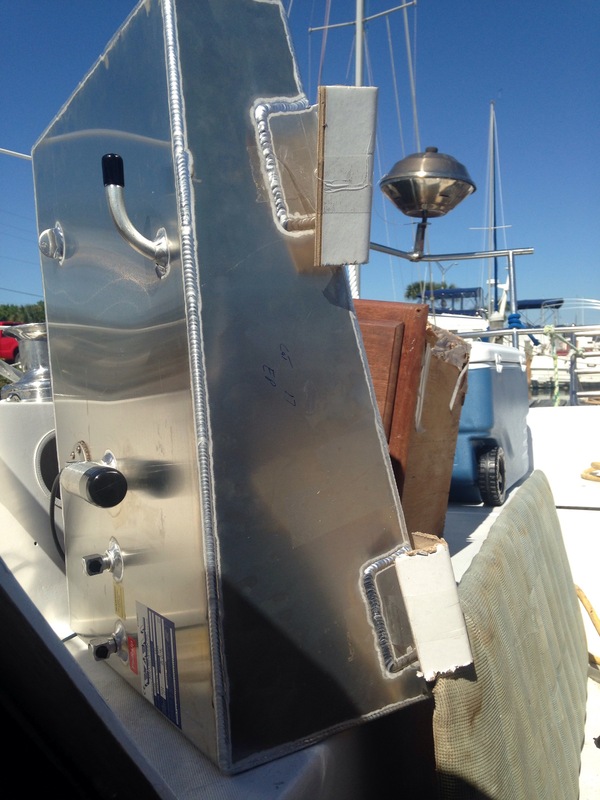 It worked like a champ to our surprise the bilge was dry. The Bell has always had a wet bilge, even on the hard it would make water when it rained. 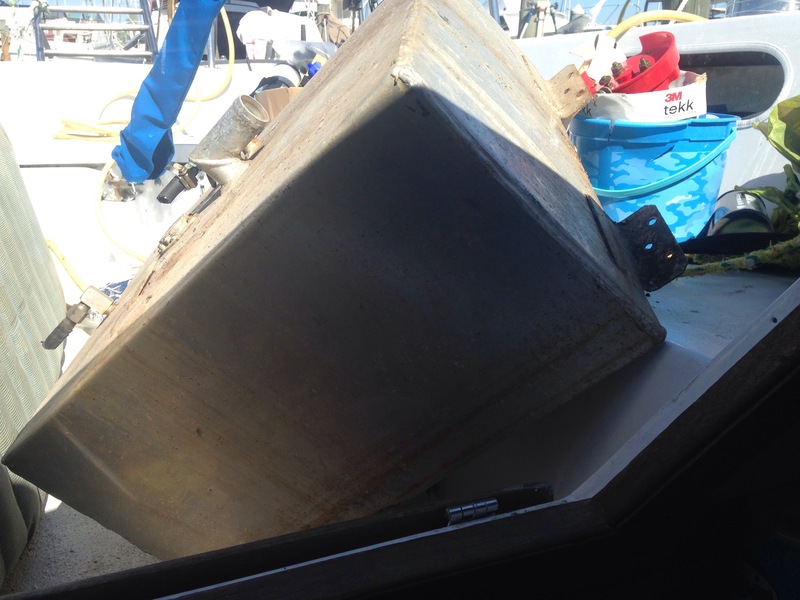 It appears the sealing of the new mast step had done the trick, she is now a dry boat. We have scheduled Friday, April 10 as the day we step the mast and place the motor in the boat. The A-bomb is running strong and is ready. Motor Work- another bite of elephant, num num num…..
With all the baby doings in addition to birthdays and holidays we have not been able to make it out to the Bell lately. However we have not been idle on working on things as I have spent a lot of time in the garage working on the motor. I had finally got the motor back together and was going through the Moyer Marine manual of check post rebuild. 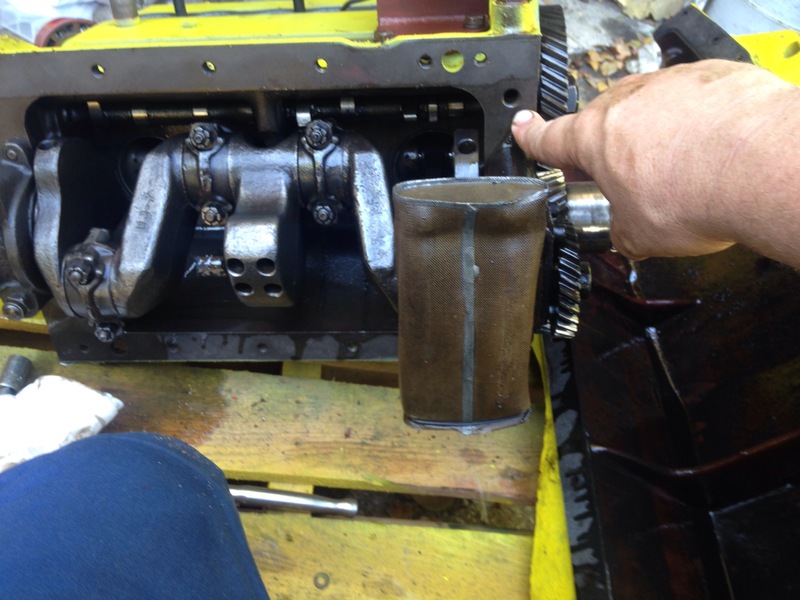 One of the first steps is to make sure the oil pump is working properly. To do this you need to crank the motor with no plugs and achieve 20psi of oil pressure. Of course to crank the motor you need to wire the starter and since I am having to build an entire motor control panel I endeavored to get that done in the process. All the gauges are new. It has fuel, water temp, oil psi and tachometer. 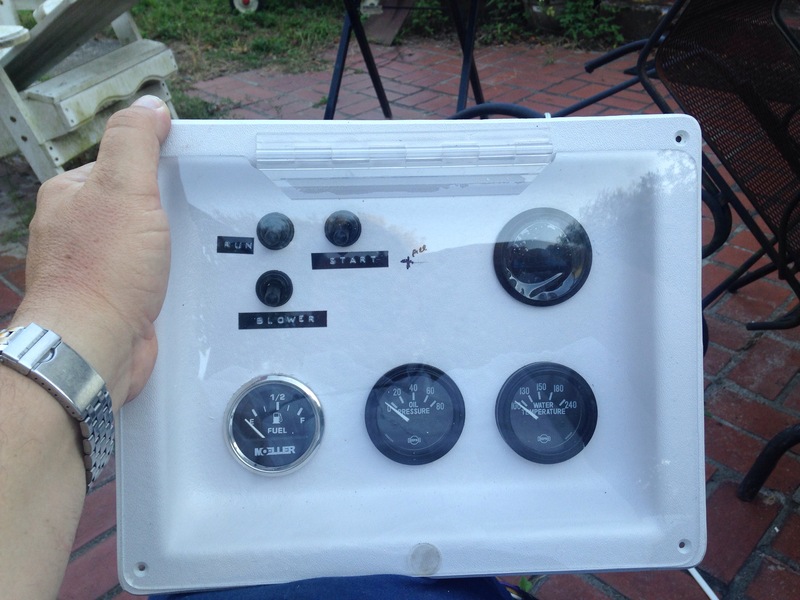 The tachometer is the only non-marine gauge in the panel, it is digital and was only about $15 or so. I had to map everything out and drill the holes for each component. For switches it has a run, start and bilge/engine blower switch. The small mark in the middle is the future position of the choke knob. Next was to wire it. 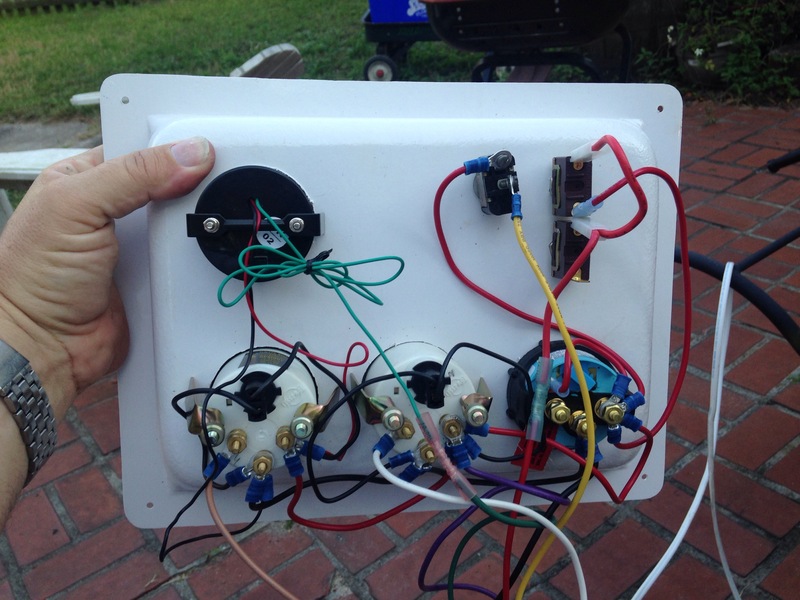 I then made a wire harness with all the applicable leads and encased it in fire retardent loom so it looks nice. Motor ready to fire up. You can see the harness to the right of the bucket as well as a sizable amount of slack bundled that I left to aid in installation on the Bell. I then tried to get the required 20psi of oil pressure required to have a safe start of the motor. This is done by cranking it with the starter at about 200rpm with no plugs and checking with a manual guage. I could not get any pressure, after asking around I surmised I had left out an oil gallery plug inside the engine. I had to take the motor back apart, removing the flywheel, transmission and oil pan to check all 3 gallery plugs and find which one was the culprit. After ordering another set of gaskets and putting the motor back together yesterday I was successful in getting the 20psi required. After which I set the timing and installed the spark plugs and wires. This morning Lori and I went out and filled the bucket of cooling water and our temp shop fuel jug seen hanging from the hand truck above. We got her to start and after a bit of fiddling she would idle nicely at 850rpm. In the video I show the 850rpm (looks fine in person), water temp at 155 and oil pressure at 20psi. The oil pressure was low still. I had to replace the old style regulator I had installed with a new style one that originally came with this block, seems the seat for the regulator was worn to match and was not making a good seal, We now have the oil pressure right were it belongs. Note that in the video water is moving through the motor pretty well. 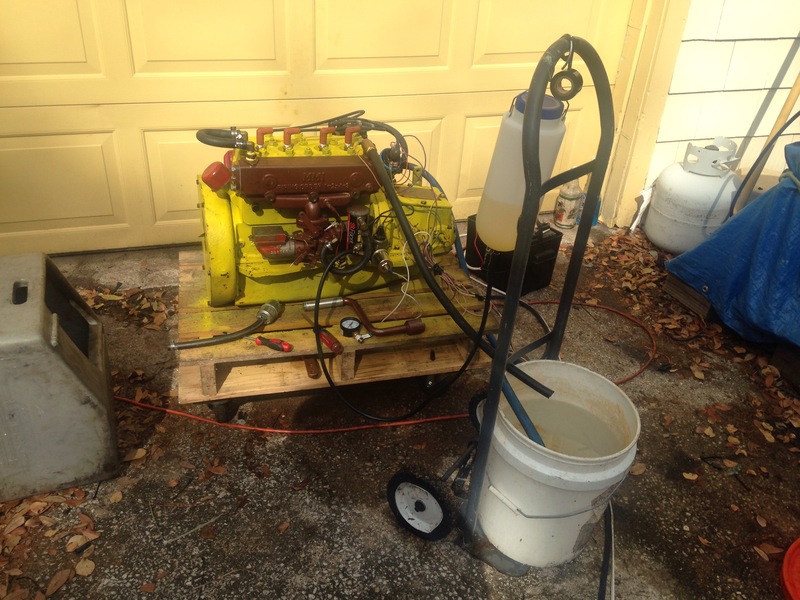 Next up is re-torquing the head bolts and fixing a oil weep on the starboard side of the transmission and a water leak at the pump face. The transmission will need to be pulled again but it is not the end of the world. After these last few items are sorted out we can drain the oil and drop the motor on the boat. Getting closer.